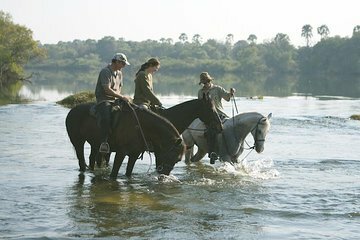 Go where cars and pedestrians can’t on this horseback riding tour from Victoria Falls. Along with a guide, explore the wilderness around the famous falls for chances to see animals like impalas, kudus, and elephants in the wild. This tour offers options for novice and experienced riders alike, making it a good way for levels of all riders to explore off the beaten track. There is a weight limit for Novice riders of 85kg. Experienced riders may be heavier depending on their riding ability and at our discretion. Helmets are required. There is a selection available or bring your own for the best fit.